I never really understood the appeal of single-speeding, having always preferred to climb by twiddling a low gear; ‘whipping the cream’ rather than ‘churning the butter’. Consequently I’d made the assumption that a single-speed would never be for me. 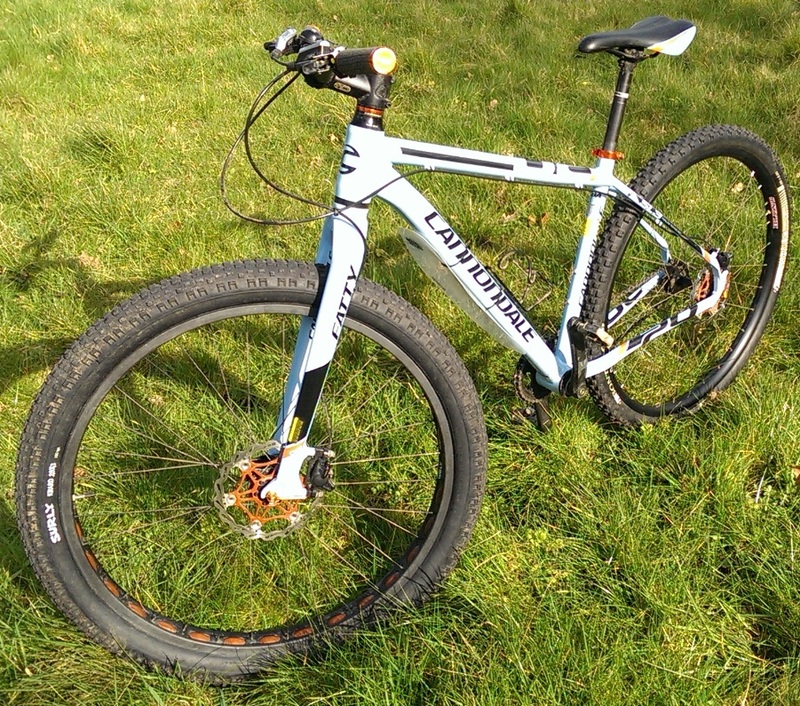 I first read a review of the Cannondale Trail SL 29er as part of a single-speed group test in Singletrack 79, Feb 2013. Something about this bike piqued my curiosity, and when I discovered I was eligible to purchase a new bike under the ‘Ride to work’ scheme, the itch had to be scratched. Certain hurdles had to be overcome before the spend was approved, however, see The things we do for a new bike. The light blue and orange colour combination is gorgeous, immediately reminding me of the Gulf Oil liveried, Ford GT40 Le Mans racers of my youth. Appreciative comments from fellow cyclists confirm my opinion, though for 2014 Cannondale have gone for black with a touch of ‘Euro-fluoro’. 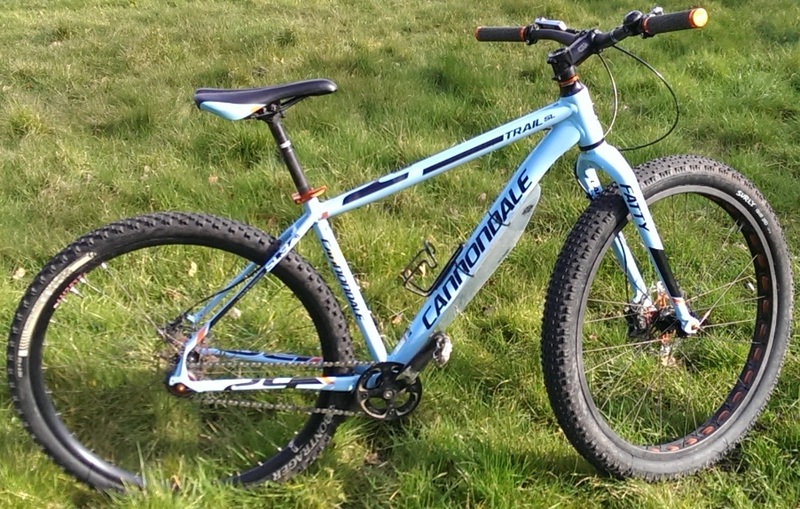 The Cannondale signature ‘coke can’ head tube and the fabricated alloy ‘Fatty’ forks give a solid looking profile to the front end of the bike. Moving to the rear, the seat and chain stays are much thinner and shaped to give a degree of flex and reduce the traditional harsh alloy feel to the ride. This bike has a reputation amongst the Muddymoles as ‘Trigger’s Broom’, as I’ve both upgraded many parts for functional reasons, and replaced others for cosmetic reasons. I confess the bike has been mildly ‘Tango’d’. The all-stainless brake rotors were replaced with Superstar Floating Rotors in orange, the black QRs were similarly replaced with Superstar Superfly QRs, also in orange. The Superstar Excel grips are exactly the same colour (grey rubber with orange end caps) as the Cannondale ones they replaced. The originals were rubbing against my thumb, and although the Excel grips are only 10mm longer, crucially the inboard lock-ring sits flush with the grips rather than being raised. They have certainly cured that irritation. I carefully planned my first forays onto the North Downs, choosing the gentlest gradients to ensure I was not embarrassed by a lack of climbing ability. Surprisingly, within a few weeks I was climbing the trails we normally use for accessing Ranmore, Yew Trees and Tanners Hatch, and it wasn’t long before the Alsatian climb up to Mickleham Downs was ‘ticked’. It helped that this was last summer, with the trails dry and grippy. The 33 tooth chain ring and 20t rear cog seems just about right for me, given that the 29er tyres make that roughly equivalent to a 32/18 combination for 26” wheels. For climbing, the bike was reassuringly agile despite the lack of ‘bounce’, and on undulating single-track the 29er wheels had that familiar ‘get outta my way’ feel of momentum conservation. This was helped by the overall light weight of the bike, as even with its current 2.75kg front wheel & tyre combination, the all-up weight is around 12kg ( 26lbs). In ‘as delivered’ spec, Singletrack weighed it in at 11kg (24lbs) for their review. I have contemplated a 34/20 or 32/18 gearing, but stating the bleedin’ obvious, you ride a single-speed bike differently. What I mean by this is that any hilly ride becomes a series of interval sessions, requiring hard efforts on the ups with recovery on the flats and downs; and there are few routes in these parts that aren’t hilly. With a full range of gears you can tailor your effort, even on the hills; then use the taller gears with minimal effort on the flats and downs. With a rigid fork as well, I have also learnt to become more adept at pumping the trail on the flats. While it would be great to be able to further increase the speed of this bike on the flats, there are still a few hills I can’t climb with the present gearing. Moving to a taller gear would simply increase the number of hills I can’t climb, and that would just be embarrassing. I’m just under 6 foot tall, and the large frame is perfect for a slightly-stretched XC position. This was never intended to be a chuck-able fun bike (see end of review below), and by setting the seat in a low position I get the feeling of being in the bike rather than on it when seated for flowing trails, yet I have plenty of leverage from the 690mm bars when stood up to climb out of the saddle (yet I’m used to 730mm bars on my other bikes). EDIT: I now have 750mm bars. I’m not sure that I notice a huge benefit on singletrack, but I do get increased leverage when standing out of the saddle on steep climbs… and they’re a more fashionable width ! The low seat position perhaps means that I’m standing earlier when climbing a hill than others, but the saddle is nicely out of the way when descending. Because I wanted to keep this bike as simple as possible, it’s the only one of my bikes that doesn’t have a dropper post. The seat post QR does occasionally see use to raise the seat on long climbs during longer rides, but on 1-2 hour rides it stays where it’s normally set. Overall, I find the lower seat position gives a relaxed, balanced feel to the bike, perhaps helped again by its lightish weight. 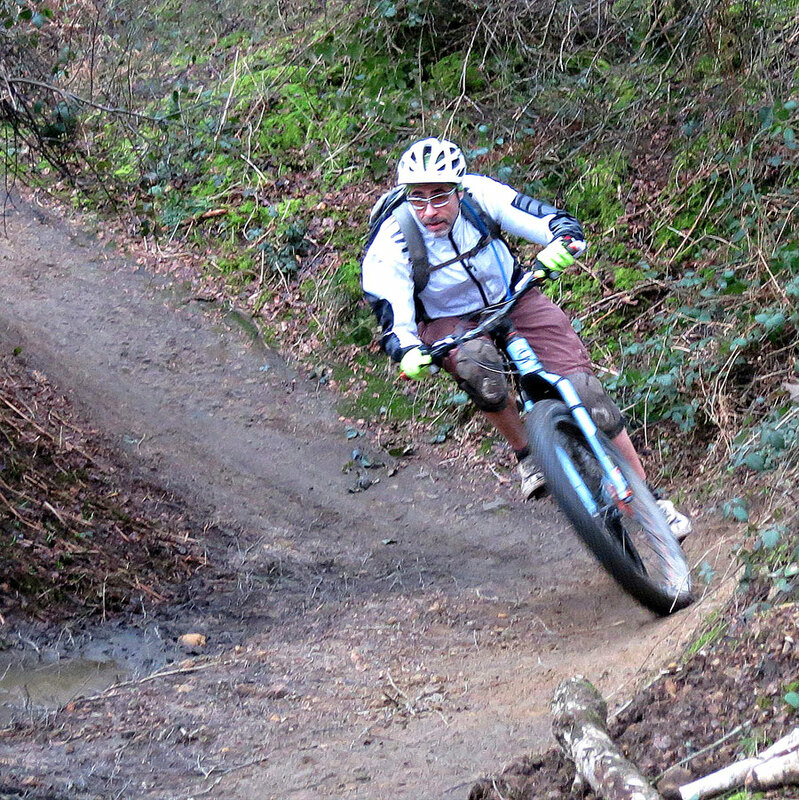 On the rootier Surrey Hills trails, the rigid fork was giving my hands a hammering. Also, this lack of bounce resulted in the bike sliding off roots rather than absorbing the ‘hit’. I had quite a few painful falls as the front wheel slid sideways, especially during damper rides. On the plus side, I was now learning to pick my lines rather than ploughing over obstacles as before. This is often cited as a good reason for riding rigid, as your line selection skills are honed which has transferrable benefits when reverting to the more forgiving, suspension-forked bikes. I’m not certain I’m seeing this benefit, but time will tell. After a few months of battering my palms to death though, I was beginning to think maybe a suspension fork upgrade was required. 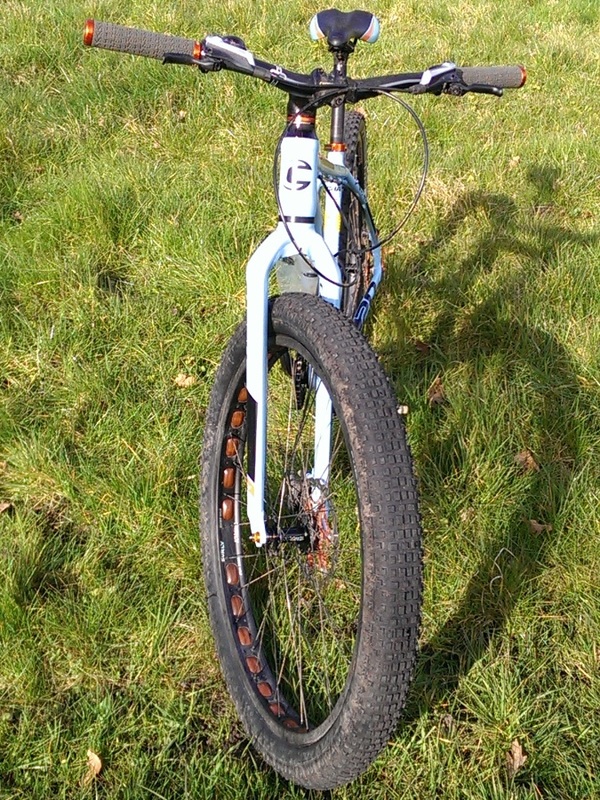 Then I discovered the Surly Knard tyre and Rabbit Hole rim. A quick check with the tape measure showed I had 90+mm of gap in the ‘Fatty’ fork, giving me a 7-8mm gap on each side, so the complete wheel was ordered from Charlie The Bikemonger. Luckily for my Tango theme, he’d also received a delivery of orange-hued Rabbit Hole rim strips. After a month or so of running this rim with a Continental X-King 2.4” tyre, the next batch of Knards arrived in the UK. For me, this tyre has transformed the bike. I can continue to ride the rooty trails at around my normal pace, and the extra 20-40mm of suspension provided by the high-volume, 3” wide tyre has almost eliminated the ‘pinging off the roots’ effect felt with the more normal volume tyres. The Knard tread pattern is not the best for tackling our record levels of mud experienced this winter, so next winter I will be looking forward to trying out the more aggressive Surly Dirt Wizard 2.75” wide 29er tyre due in this country around mid-summer. That said, I have been running a Bontrager XR Mud on the rear, which has also been struggling for grip. Generally, my Knard-shod front end has not noticeably been lacking grip when riding with my buddies on mud-specific but smaller tyres. After initially running it with the Surly Knard-specific inner tube, I’m now running it ‘ghetto tubeless’. I’ve had no issues with this set-up, and am generally running a tyre pressure around 8-10psi. I will try running it as a normal tubeless tyre using gorilla tape in the near future. The bike came with Shimano mechanical discs as standard. These are best described as adequate. I found that the pads seemed to suddenly ‘go off’ and stop working during a ride. A change of pads, and all would be fine again. After a particularly challenging ride to Leith Hill, which required the negotiation of some rooty and slippery descents (LandRover, Deliverance) with no back brake to speak of and a front brake that couldn’t quite stop me, I obtained a set of Shimano Deore brakes for less than £70 from Merlin Cycles. Along with the ‘semi-fat’ front tyre, these have transformed the bike. Adjusting the chain with the as fitted Eccentric Bottom Bracket was a real pain, requiring the removal of a crank arm and a severe beating with a mallet. The Niner Biocentric BB is a much improved design, by loosening two allen bolts and with a gentle tap from a mallet to release the ‘grip’, I can rotate the BB by hand to take up the chain slack. Along with hydraulic brakes, this is another essential upgrade. Whether it was in the manufacturing process or as a result of several months use with the original EBB, the BB shell in the frame was ovalised, and required a considerable amount of honing (getting through three Draper honing tools in the process) before the shell would take the Niner BB and allow it to spin freely. EDIT: The Bushnell EBB is a better fit for the BB shell than the Niner, see post below. This sounds like a much better option than the Niner. To complete the semi-fat theme, I have replaced the original rear wheel with a Velocity Blunt 35mm rim laced to a Surly ‘Ultra New’ hub (matching the front wheel). This has noticeably widened the relatively narrow 2.0” XR Mud, and I’m hoping to squeeze something like a 2.4” Maxxis Ardent in there for the summer. This should help provide a little more ‘give’ for the additional grip on the drier (fingers crossed) summer trails. These days, I’m a single-speed convert, and there’s no doubt the miles I’ve put in on this bike have paid dividends in improving my climbing ability. The Cannondale Trail 29er SS is now my winter bike of choice, and I’ve put 1120km (700 miles) on it in the 8 months since purchasing it in July. For winter, it seems to have replaced the Alfine-hubbed, On-One Inbred 456. The ‘dale will get ridden in the summer as well, especially for short and sharp local blasts where time is short, or longer XC-style rides where the route doesn’t include drops or jumps. What riding it in its current guise has done, however, is show me how much fun the ‘semi-fat’ tyres can be in giving extra grip and cushioning to compensate for the lack of suspension. So much so, that I’ve now placed a deposit with All Terrain Cycles for a Surly Instigator 2.0, described by Surly as having “loads of traction and cushion yet you can still accelerate like mad” and made to “swoop, rail, hammer, drift, carve and fly”. Although bought on a slight whim, I’m amazed that this has become in many ways my favourite bike; competing as it does with my Santa Cruz Superlight 29er (120mm front/100mm rear) – ideal for Surrey Hills and longer XC rides, Pace 506 (170mm front/150mm rear) – my uplift day & Alps bike, and the On-One Inbred 456 (140mm front) – previously my winter bike. The gearing is spot on for those new to single-speeding; and once you accept the limitations of a rigid fork, the handling of this bike is great, aided by a reasonably compliant frame and its overall light(ish) weight. You either need to source a great set of mechanical disc pads, or upgrade to hydraulic brakes. The cheaper Shimano options have proved to be an excellent buy for me, and good value between £65-80. Also, the EBB needs to be replaced to make the chain adjustment an easy task. The Niner Biocentric is performing well so far (currently £51 at Stif Cycles), but there are other alternatives, Phil Wood etc. Alternatively, fit a cheap chain tensioner, though that would spoil the elegant lines of the frame. Whatever you do, lose the original EBB. The handling of this bike is excellent, with the stiff front end allowing you to select your lines precisely. The rear follows the front with little drama, though I have experienced slight flexing in the rear wheel when taking bumpy corners at high speed. Nothing too alarming, and in my experience this affects most larger diameter 29er wheels. Obviously I need a carbon rim upgrade! Tyre pressure selection is a bigger issue than wheel flex, with higher pressures required for the faster, drier trails to prevent tyre squirm. Because of its simplicity, in that there is no rear mech & cassette and no suspension, the bike snaps forward when applying the power, and feels much like a dog straining to escape the leash. Well, early in the ride when my legs are fresh, that is. For me the biggest handling issue was the rigid fork. There’s plenty of room at the front for the new 29+ tyres, so select a 35mm wide or greater rim, run a big tyre tubeless at around 10psi, and the bike will be transformed. You don’t have to fit a wider rim at the rear, but I couldn’t resist. Sadly there’s not enough clearance for a 29+ tyre here. The current 2014 model, retailing at £750, has hydraulic brakes and an FSA EBB as standard, potentially saving the cost of these upgrades. If you can find this model at a discounted price, and you fancy trying a single-speed, then buy it. You will enjoy it, guaranteed. Damn, that beer can has some girth! Nicely detailed review Dandy. There ain’t no excuse for the one or two paragraph reviews proliferating currently. Or ones that waffle on without giving things a proper critique. The pair don’t sound like they should go together but I do appreciate a smooth ride from a rigid bike. I like what you’ve done with the Knard, even swapping out a Mud X to a Purgatory keeps it quite a bit calmer up front. Interestingly, the fat tyres, flexy carbon handlebars and seatpost on my Salsa are clearly struggling to keep the ride comfortable. To say the carbon frame, fork and wide wheels are rock solid is a major understatement. My steel Singular, on the hand…smooth as a Galaxy bar melting! Hi Elliott, sounds to me like you need an accurate pressure gauge that reads in single digits as Andy suggest. When I tried the Surly at Swinley I felt it was over-pressured but suspect it would take several rides to find the sweet spot that was undoubtedly there. I was writing more about the harsh ride from the solid parts of the bike. The tyres seem to be doing a good job of cushioning. I did try a couple of gauges but haven’t yet found a good one. Mainly because I can’t be bothered to order one from the US. The track pump was reading 7psi for the last ride but I’ll keep experimenting. Darn, I was hoping you could point me in the direction of a decent gauge, I’m still looking. Yeah…..thanks for that detailed review D’Andy, I’m more in the two paragraph set! There’s no doubt in my mine that the tyre choice is critical to a comfy ride. The Nobby Nics 2.35 certainly kept my rigid rocking and now used on the El Mariachi with suspension forks they offer oodles of grip. I still want to ride a Krampus! I’d be keen to try those bikes you mention Andy, the Krampus interests me too. I’m not sure ‘fat’ will become mainstream but suspect it will be a common sight once people ‘get’ the fat tyre thing. It will be interesting to see how the addition of suspension forks to the mix helps/hinders – there’s a lot of undamped movement in tyres at that size before the fork comes into play. I enjoyed this review and am not sure how your semi-fat odyssey could have been captured in fewer words! The tables are quite a luxury of information (and took me a while to code up) but again they get the point across, which is a bike with a decent base can always be adjusted to taste (I appreciate the irony of the word ‘taste’ used on your review!). Great review tho I can’t believe you have bared your sole with details of the extra spend that makes it such an expensive cheap bike!! If the missus reads the review, you may find yourself having to fund some retail therapy to appease her. This bike really intrigues me – please can I join the queue to borrow it for a proper spanking ? I had a nice little ride earlier on my own rigid SS, which only sports a 29er 2.4 Chunky Monkey up front (at 20psi) and managed a few little jumps and gaps without too much brutality to my wrists. Is your front wheel a QR? If so, I’d love to pop it onto my bike for a go one day? Indeed the front wheel is the standard (9mm – I think) QR, so you should be able to swap mine in ok. You need about 85mm gap at the top of your forks for it to fit. We’ll arrange a swap at some point, no problem. Trying to squeeze an Ardent in the back of the ‘dale. There’s about a 2mm gap between the edge of the knobbles with it at 30psi. Trouble is, it’s not holding air at the moment, too much leaking between the bead and the rim. 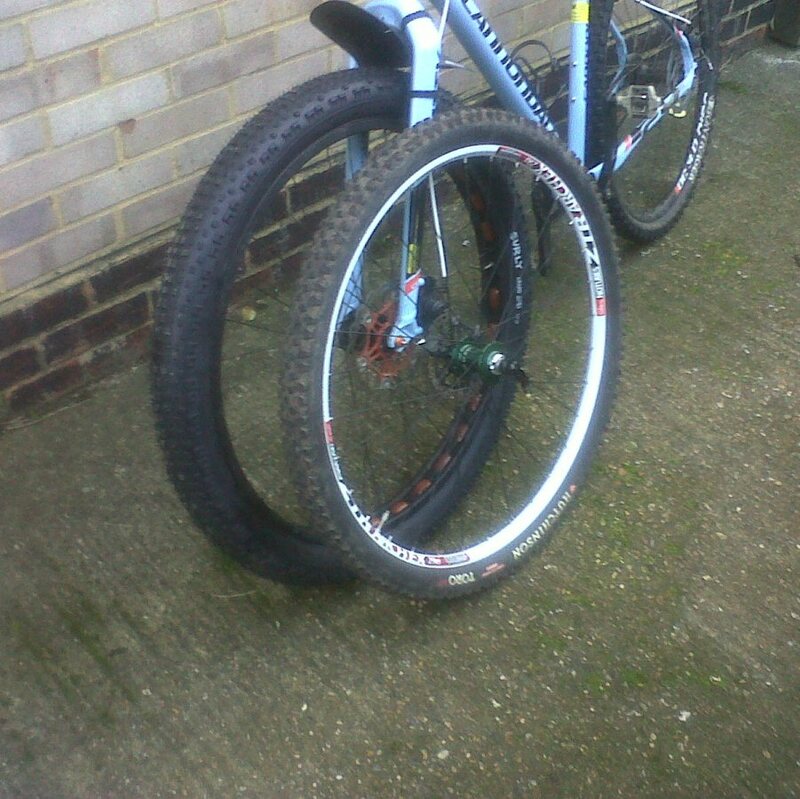 They’re not tubeless-ready tyres, so might have to go ‘ghetto tubeless’ on the back as well. That was meant to be a response about Elliot’s tip re the Meiser gauge, btw. I’ve just got a Joe Blow Mountain track pump – double the volume per stroke and twice as accurate gauge (since it only goes up to 70) – worth considering? Totally agree. I got one using cyclescheme as a cheap and cheerful commuter. Prior to this I had only ridden road bikes, never had a singlespeed or a mountain bike before. It’s a blast. I did however change the gearing to 14 tooth cog and 36 tooth chainring because I was spinning out all the time. I live in the North West and it’s not overly hilly so this combination works for me on the roads and on trails. Apologies for the beginners questions here but I’m getting a new Trail SS and would appreciate the benefits of the Niner eccentric BB… can I simply purchase one and slot it in or is it more complex than that? Is it reasonably to expect the LBS to fit it if I took it in at the time of purchase (obviously giving them ample time to fit – certainly wouldn’t expect it there and then). Hi TJ – my advice, as I mention above, is to do exactly as you plan. The benefit of the Niner (or similar) EBB is not only the ease of adjustment, but the fact that the Niner clamping approach does not distort the BB shell. You will avoid the problems I had of the BB shell being distorted by the ‘split wedge’ approach, thus making any subsequent change of BB a right royal pain in the ar5e. … and in answer to, “can I simply purchase one and slot it in?” Yes, you can. It will be easier to get the LBS to order it as they can make sure they specify the exact requirement needed; that’s what I did. Thanks. I’ll start thinking about your other upgrades too! The Niner BB OD is 55mm – the ID of the frame is 54mm – it doesn’t fit I’ve just found out! Unfortunately the EBB on the 2014 model seemed to suffer from the same issues as you describe. Just a little advice for anyone else reading this, I swapped out the BB shell for a Niner Biocentric II as you suggested however the shell is 1-2mm too small all the way round and would have required quite a bit of honing. To avoid invalidating the warranty I returned it and bought a Bushnell EBB instead – slides right in and after a good 8-10nm torque there’s no creaking or issues whatsoever. Thanks so much for your blog! It’s inspiring. I’ve a 2012 SL3 SS and have been working through the upgrades. Really enjoy the bike and all this tweaking brings back the joy of biking. Replaced the bottom bracket with the Bushnell Jeff Jones & XT brakes from ebay with 180 discs front & rear. Just received a Surly Rabbit Hole rim with surly hub and white industries freewheel. Still running the stock 33 x 20, but am going to start playing around with that. Hi TF – I’m glad you found this article useful. Within the limitations of the frame, I think I’ve now got this bike ‘spot on’. I’ve no desire to change the 33 x 20 gearing myself; it can feel a little under geared on the downs, but then I’d struggle with the short, sharp hills around here if I made it any harder for myself. I suppose I could fit a 19t rear cog in the summer, when the ground’s a little faster, but that’s about as far as I’d want to go. Fitting the 3″ Knard on that Rabbit Hole rim will really improve the front end comfort, and make it a real pleasure to ride. Enjoy. What I have really enjoyed about this bike is being able to build up a better bike as I go. I couldn’t spend a lot of money when I bought it but I didn’t feel like I cheaped out. Didn’t want to spend 500 more and wind up with a heavy, purely mediocre stock bike. It was solid value and a super fun bike to ride while I have been upgrading as I go. I added a 100mm rock shox Reba rlt on the front and descents are -amazing- now. The lockout is solid too so climbs are still enjoyable. Have found a 33/16 gearing to be a good compromise for ok road speed and not too harsh climbs, but I’m lucky to live on the praries…. Pedals I added kona wah-wah’s which are a great choice for their low profile and super ultra grippy. I was getting hung up a lot on roots etc with a set of dmr v8’s. Next week’s project is the addition of my improvised, full xt 1×10 drive train. With some savvy pinkbike and chainreaction bargain hunting, all told I will have spent about 1500 dollars on a pretty sweet ride, kept close enough to the original weight, which I’m waaaay better off with than if I had spent that amount on something new in the shop. Thanks I really enjoyed your review and I agree with everything, especially the POS ebb! Wow, that’s some transformation. Not only have you changed many of the major components, but you’ve also changed it from a rigid single-speed to a bouncy 10-speed ! At its heart it’s a great handling, light alloy frame; around which you can build the bike you want. I’ve other bikes that tick the ‘gears’ and ‘suspension’ boxes, so I kept to the rigid, single-speed approach. Even so, my bike is known as ‘Trigger’s Broom’*, but you’ve taken it several steps further ! Thanks for the detailed review Dandy, it was impossible to find any other decent information on the bike elsewhere. I pulled the trigger on the 2014 model a few months ago for less than £500 (from Triton Cycles – who still have some sizes for less than £450 now) and haven’t regretted it. Bizarrely I just noticed that mine came with an 18t cog which is a little too hard work on some of the South Downs but Triton are now sending me a 20t as per the advertised spec. Thanks again and please feel free to recommend any decent spots or group rides in the North Downs! It’s still close to being my favourite bike, being light and responsive, and I had a great time out on it yesterday on the Kent side of the North Downs (see the ride report I’ve just posted). You’re welcome to join us on one of our regular North Downs rides on a Sunday morning. There’s often a few of us out on single-speeds, though I’m usually the only one daft enough to have a rigid fork ! Keep an eye out for the ride postings on the forum. Have been looking around for ages for another bike ..something different! Fat bikes seem to be extinct as far as my size goes! Already have a Ghost FS, Spesh road bike ..and was thinking a cheap hard-tail to take me back to my roots! Then … i saw the Cannondale 29er ss!! (2015). That got me thinking … and now have convinced myself (almost)! Still apprehensive at how I am gonna cope with the hills (and not get laughed at!) but after reading your very informative review and, most importantly, the excuses for getting another bike, I am gonna get one! Am up in Yorkshire so will have plenty of hills to challenge me!! Thanks again for your info! oh yeah … suspension forks ..you got one fitted yet? Or rely on the big tyres? Glad you found the review useful, Leigh. I used the Cannondale today for a 15 mile blast along some great single track in the rolling Kent down land. Yes, there were two short climbs I had to push up, but then so did some of the guys with gears. Maybe start with easier gearing, and swap to a smaller rear cog if you feel up to it. As for suspension? No, I just rely on the 29+ tyre at 8psi, but my local trails are mainly loam in summer that turns to mud in winter. If your local trails are rocky, and in Yorkshire they may well be, then maybe suspension makes sense. I have the 2015 ‘dale trail ss and it’s my second mtb. I was on a giant yukon before. I’m wondering how you think a 27.5+ on the front would handle compared to the 29+? I will keep the stock 29 rear for now. I am looking to upgrade the front and am torn between the two sizes. At 5’10”, I am a lil stretched on the large frame and plan on trying a shorter stem. I’m no expert, Alex, but the outside diameter of a 27.5+ will be about 2″ less than a 29+ tyre. I believe (and you might want to verify this) that a 1″ change in length is equivalent to a 1 degree change in head angle. So where my 29+ may have slackened the head angle by a degree, fitting the 27.5+ tyre would steepen the head angle to 72 degrees. That’s quite a lot steeper than the current fashion for slacker HAs, and may make the bike uncomfortably ‘twitchy’ on the rough stuff. I’ve recently purchased a niner biocentric 2 on your recommendation. Accepting fitting may be problematic due to ovalising do you also need to have the bb faced or is this already done by C’dale? I’m not sure that I know, to be honest. My LBS fitted it for me, but I would guess that as it works by clamping against the outer faces of the bb shell, then yes, it should be faced. It certainly won’t do it any harm. I suppose you could ask Niner or their distributors directly if you were keen to save any additional expense. Hope that helps? I have one of these. Bought on a whim. Prior to this I was a roadie. This is the most fun bike I’ve had. It has had a lot of modifications (I’m still a weight weenie) but I agree with you I don’t need another bike. It’s good on roads, good on trails and good over hills now I’ve got my gearing right (14/38). I’d recommend this bike to anyone because the frame is brilliant.